It’s human nature to forget about the horrors in life, especially the emotions attached to those horrors. That’s because the ability to forget is a feature of our consciousness, not a bug. Yet there are some emotions associated with events that are nearly impossible to forget, no matter how hard we try. Unfortunately, two of those events happened to have occurred in September. The first, and most horrific, was the events of 17 years ago this month. That, of course, was the terror attack on our nation on September 11, 2001. Much has been said over the past few days of the heroism, valor and tragedy associated with this anniversary. Yet, what stands out for me is the difference between the brotherly sense of unity so many Americans felt on September 12, 2001, and the sense of division so many seem to feel on September 12, 2018. Suffice it to say that “blame” for this division can be found in many places, including our universities, our cultural discourse, our social media interactions, our sporting events, and, of course, in the highest branches of government. I just hope it doesn’t take another devastating attack to bring America back to the sense of unity we felt 17 years ago today. The second event, while less devastating than the terror attacks of 9/11, was no less jarring from a psychological standpoint — especially if you had money invested in the financial markets. You see, it has been 10 years since the collapse of Lehman Brothers, a fantastically swift implosion of the sort that hadn’t happened to an American financial institution since the 1930s. Now, a deep dive into all the various facets of the financial crisis is beyond the scope of this publication. But for a well-rounded look at the many different aspects of the financial crisis 10 years gone, I recommend the Wall Street Journal’s special feature, The Financial Crisis: 10 Years Later. Here you will find feature articles on such varied topics as: The aftermath of the crisis on so many investors’ lives; Warren Buffett’s explanation of the crisis and why so many of the key players then think it’s unlikely the same thing will happen again. Perhaps the most important feature here is on the possible triggers for the next financial crisis. Potential catalysts mentioned in this article include rising interest rates, the explosion of debt and the so-called “debt bomb,” and a potential cratering of the Chinese economy. Since that devastating month 10 years ago, the market has made a remarkable comeback. 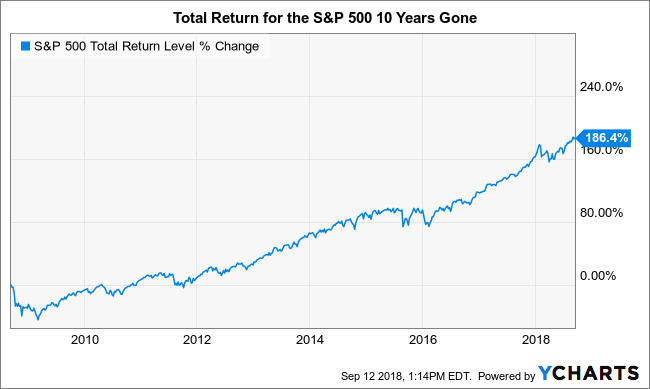 Consider that over the past 10 years, the total return on the S&P 500 has roared back more than 186%! This shows not only the resilience in the American financial system, it also shows the resolve of investors to get back in the fight after a devastating defeat. Here again, it’s another feature of our consciousness, and not a bug. Yet maybe the most important thing to remember here about the financial crisis 10 years gone is what Led Zeppelin tells us, which is that things that were have a way of returning when we least expect it. And though the course of those things/events may be altered, the river will always find its way back to the sea. That’s what rivers do. That’s what markets do. That’s what humans do. At some point, we can expect another destructive market meltdown. At some point, we will have to deal with the detritus of systemic financial loss. It may take another 10 years, or it may come far sooner or far later. The best we can do, as investors and prepared citizens, is to make sure our own financial and security concerns are in the best shape they can be. That means diversified equity and fixed-income exposure, avoiding the accumulation of excessive personal debt and making sure we are prepared for the worst-case scenario even if that day defies the odds and never comes. 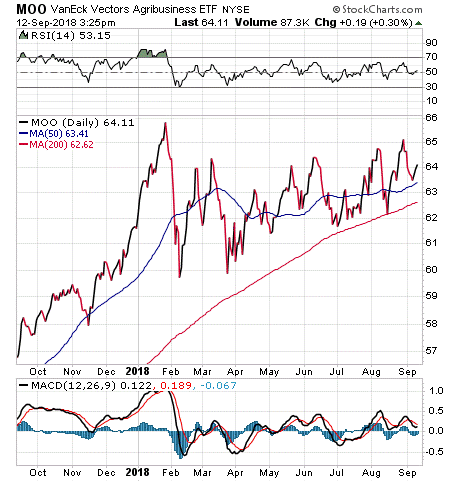 As an exchange-traded fund (ETF) tied to the global agriculture industry, the VanEck Vectors Agribusiness ETF (MOO) is in a fairly concentrated area of the market, but one with significant potential. According to a 2015 McKinsey & Co. report on global opportunities in the agriculture field, food and agribusiness — agriculture conducted using commercial and technological means — had a total global footprint of $5 trillion. Feeding the global population has become an important issue again in recent years, and it is attracting the attention of global investors. On a broader scale, the agribusiness industry, MOO’s primary focus, has been growing at a steady clip. The McKinsey & Co. report stated that global investments in the food and agribusiness sector grew threefold to more than $100 billion from 2004 to 2013. However, on an individual level, MOO has also been seeing a significant amount of attention from large institutional investors. For example, IFP Advisors boosted its position in MOO by over 6,000%. It was among several institutions that recently purchased shares in the fund. Although MOO has more than half its portfolio weighting in the United States and Canada, agribusiness in South America, where MOO has a small 3% allocation, is showing good potential and could impact the fund’s global allocations in the near future. A 2018 report by Valoral Advisors indicated that mergers and acquisitions (M&A) activity has been increasing steadily since reaching a low point in 2015, when political uncertainty and low commodity prices impacted Brazil and Argentina. MOO invests heavily in large-cap companies and has a weighted average market cap of $18.5 billion, as well as a price-to-earnings ratio of 19.2. Although the fund is up only 3.5% year to date, it has seen price appreciation of more than 50% since early 2016. Investors also can pick up a small yield of 1.4%. The expense ratio is 0.51%. As the global agriculture sector is fairly compact, the VanEck Vectors Agribusiness ETF portfolio is only comprised of 58 holdings, with the top three sector weightings being Consumer Defensive, 35%; Basic Materials, 28%; and Industrials, 19%. The top 10 individual holdings comprise 52.54% of total holdings and are led by Nutrien, 8.40%; Deere & Co., 7.50%; Zoetis, Inc., 7.28%; Archer-Daniels Midland, 6.50%; and IDEXX Laboratories Inc., 5.14%. The VanEck Vectors Agribusiness ETF (MOO) offers investors a chance to participate in growth trends in feeding the world’s population, and some access to one of the few positive markets in frequently unstable South America. Investors interested in either of these potential trends, or in having greater exposure to agriculture, may want to perform their own due diligence on MOO. Is it better to be the tortoise, or the hare? Well, when it comes to learning lessons in life, former Marine Corps F/A-18 fighter pilot, best-selling author, business consultant and possible future presidential candidate Ed Rush says it’s always better to be the hare. In fact, speed is a key concept with Ed, and he should know a bit about speed. A veteran of more than 50 combat missions, at the height of his military career Ed was the No.1 instructor in the Marine Corps for one-against-one aerial combat, a.k.a. “dogfighting,” and was instrumental in the training and development for the new F-35 Lightning II Joint Strike Fighter. Ed also happens to be my guest in the latest episode of the Way of the Renaissance Man podcast. The success-enabling habits Ed learned in the Marine Corps. The difference between external discipline and self-discipline. Ed’s “21-day adventures,” a time frame he says is all that’s needed to make real changes in one’s life. Ed’s plans for a presidential run in 2020. 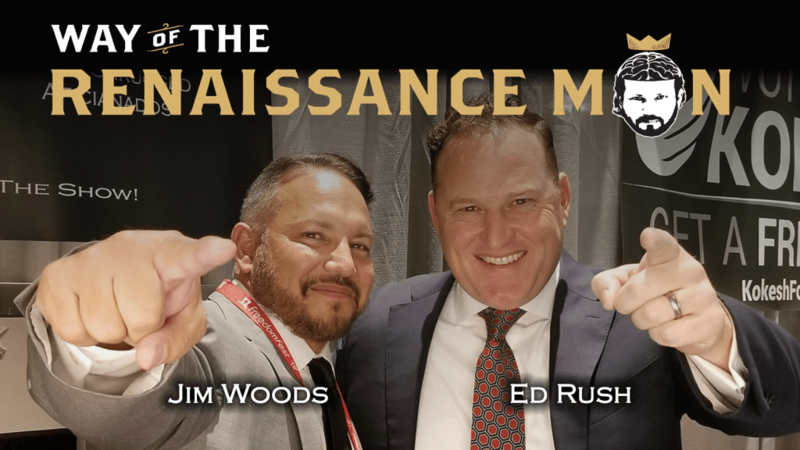 If you want to get motivated, entertained and educated by a badass Marine, then this episode of the Way of the Renaissance Man podcast with Ed Rush is perfect for you. The influential psychologist is considered the founder of the analytic school of psychology, and the first to differentiate two classes of people according to attitude types: extraverted (outward-looking) and introverted (inward-looking). In today’s quote, Jung reminds us of the importance of accepting reality, however unpleasant, so that we can ultimately change it for the better. And, until then, the importance of avoiding self-condemnation.